we're always open to explore great talents! Congratulations! You just found the career page of Indonesia’s happiest e-commerce to work at! We offer a range of exciting opportunities, so feel free to explore before you miss out. 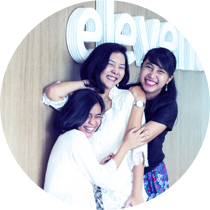 As one of the fastest growing e-commerce platforms in Indonesia, elevenia is packed with happy employers and employees aiming to spread happiness to its buyers and sellers. Our goal is to provide the best service for our customers and the best support for our sellers –therefore, in order to achieve our goal, we are definitely seeking for exceptional talents to join our team. Do not spot any relevant vacancies?